This Cotton Sofa Cover Protector Is Durable, Not Fade And Allergic, Protect Your Sofa Away From The Dust And Pets Hair, Provide Your Furniture A New Vision And Meet Your Home Decoration needs. ❶ Cotton Fabric,Soft And Comfortable, Do Not Fade And Shrinking, Natural Health.machine washable. ❷ Drape Naturally,Sofa Slipcovers And Sofa Match Well And Not Easy To Fall off. ❸ the sofa protector is durable and stain resistant,Protect your sofa from pets, Children and insects. 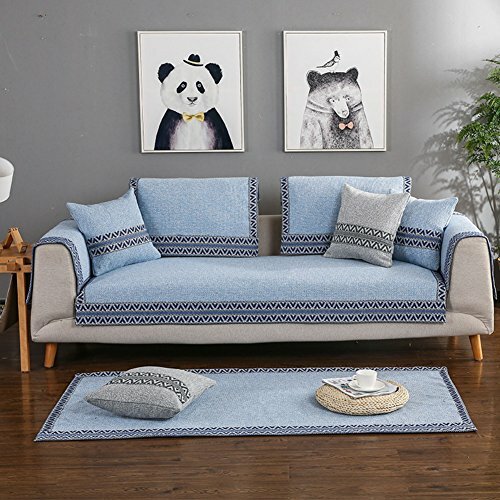 ❹ our couch cover sold by single piece with different size separately.The sofa protector can be used as sofa cushion cover,Backrest cover,Armrest cover.The specific circumstances need to refer to your sofa size. ❺ moderate thickness, Four seasons common use.